Getting robots to collaboratively interact with humans has been a goal for many robotics researchers. Dr. Aaron Edsinger is a proven entrepreneur and inventor in the field of human-collaborative robotics. Over the course of his robotics journey, Edsinger has developed humanoid robots at the Massachusetts Institute of Technology, to co-founding four robotics companies, two of which got purchased by Google. Edsinger has a bachelor’s in computer systems engineering from Stanford University, a master’s in computer science from MIT, and a Ph.D. in computer science from MIT. He did post-doctorate research in the Humanoid Robotics Group at the MIT Computer Science and Artificial Intelligence Lab (CSAIL). He co-founded his first company, Meka Robotics, in 2007. That same year, he started his second company, HStar Technologies. 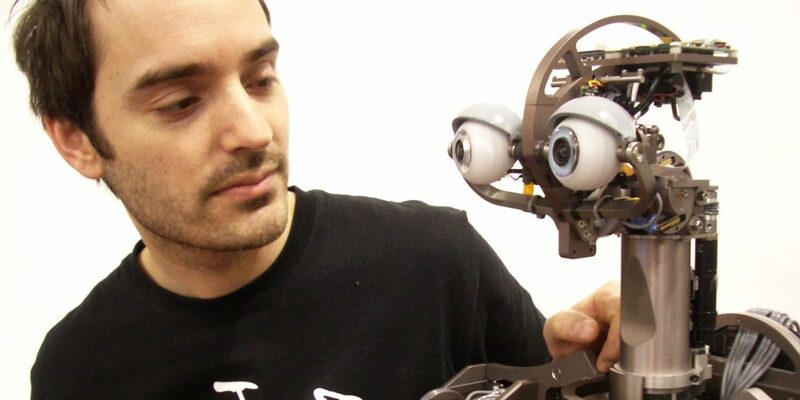 In 2011, he cofounded Redwood Robotics, and in 2013, he sold Meka and Redwood to Google. From 2013 to 2017, he was a robotics director at Google. 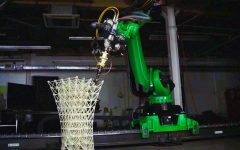 In August 2017, he cofounded Hello Robot Inc.
Edsinger’s work in robotics grew out of the San Francisco robotic art scene in the 1990s. Since then, he has collaborated and built more than a dozen research and artistic robot platforms, and has been granted 28 patents. His world-class robotic systems encompass innovative research in dexterous manipulation in unstructured environments, force-controlled compliant actuation, human-safe robotics, integrated mechatronic engineering, and the design of humanoid robots. Domo, the humanoid robot he built, was named one of Time magazine’s Best Inventions of the Year for 2007. Joanne Pransky, associate editor for Industrial Robot Journal, recently spoke with Edsinger about his projects and career. Pransky: You’ve teamed with many different organizations on various robot projects over the years. What has been your favorite project and why? Edsinger: I think my favorite project would have to be Domo, the MIT humanoid that I built for my Ph.D. work. Professionally, it represented a culmination of seven years of work and it was the cornerstone that set the course for my future work. It was also a labor of love and, to me, a work of art. I was involved with all aspects of its development – from the electronics to the mechanical design, up through the firmware, controls and HRI and manipulation algorithms. This was done in collaboration with partners Jeff Weber and Charlie Kemp, both of whom I continued to work with for many years afterwards, so it really was a formative project for me. A funny story is that I designed nearly the entire robot before I told Rod Brooks, my advisor, what I was up to. Better to ask forgiveness than permission, I figured. Pransky: Can you compare your expectation of how you thought you would respond to Domo prior to your interactions, to the actual interactions that were cultivated by the relationship? Edsinger: At the time, Cynthia Breazeal’s social robot Kismet had predated Domo in our lab by a couple of years, so I had an initial expectation that Domo’s interaction would be centered on vocal cues and eye gaze. Domo, built from the ground up, went from being a mechanistic relationship to something that felt more like an empathetic relationship. I ended up giving it these simple, soft hands with silicone skins. When it would reach out and grab your hand, it felt very different and unexpected. This reaching and grabbing behavior, combined with Domo’s eyes and eye gaze functionality being turned on, really changed how I experienced the robot. Edisnger’s Domo humanoid robot was named one of Time magazine’s Best Inventions of the Year for 2007. Pransky: Do you think that developing a relationship with a robot is necessary, or even a “good” thing – or is it enough that the robot just gets the job done? Edsinger: It depends on what the job is. Domo was interesting in that it was both a social robot and a pair of manipulators. My work has evolved further away from the social robot aspect and I’m now more interested in robots that are functional and useful to people in their homes. I’m still a very strong believer that the human–robot interaction has to be considered in the design such that the user accepts and feels comfortable around the robot. At the same time, I don’t think that people simply want an “Alexa” or Google Home with cute robot features like big eyes. I think that’s indicative by the recent downturn in social robots such as Jibo and Kuri. There is a place for social robots, but we’re presently seeing the market say, “Well, we’re not quite sure what the value is there”. Pransky: One of the key tenets of your work is that you use robot hands, eyes, head and arms to interrogate the objects and environment that the robot encounters. This is what we do as people, but when a person explores the world in this way, the knowledge they acquire stays within the person that does the interrogation. Is there scope for robots to share this learning experience with other robots, or do you think that each environment is so unique that any knowledge gained has no value outside the immediate scenario? Edsinger: The work that I started with Domo and have continued since then is based on Rod Brooks’ pioneering philosophy: the robot’s behavior is very much an emergent phenomenon based on the interaction of its internal state – algorithm and hardware – and the environment it’s in. What I’ve done in my career is design and build robots that really exploit this synergy between the external environment and the system of the robot. In terms of the question of “transfer learning”, if you take the robot out of the environment it’s been designed for, it’s going to be non-optimal – and to some extent people are like this as well. A common mistake I see in robotics is to take a very general approach and solve problems in a general way rather than to deeply consider the robot design, sensors, algorithms, etc. in the context of the problem it is solving and the environment it is in. Of course, a balance is required – and the general approach has its place, but too often the real physical world is treated as an abstraction. The Meka S2 Humanoid Head, a seven-degree-of-freedom robotic active vision head, was designed as an aesthetic, expressive, sociable robot. Pransky: For those PhDs thinking about becoming entrepreneurs, can you discuss the advantages and disadvantages of owning your own company versus having a parent company such as Google own it? Edsinger: It’s an interesting trade-off. Certainly, the benefit for a big company like an Amazon or Google or Bosch is that you have a safety net. You have significant funds to focus on the technical and product work for as long as you can keep upper management happy. You can afford to hire an exceptional team. There’s always a risk that the upper management may change their mind or their direction, or that financial pressures cause your program to get cut – and it can be frustrating when great technology from your acquired company gets mothballed. One thing that I’ve seen being on the big company side, is that without a scarcity of resources it can be very hard to focus on what really matters and which problems to solve. Robotics is a very broad space and it is easy to burn a lot of time and money on the wrong problems. In contrast, in a startup the scarcity of resources necessitates a “focus or perish” mentality. I think this scarcity can also foster great technical creativity and risk taking that is harder to find inside of a big company like Google. I think it is probably good to see both and work at both, and I would recommend to a new PhD to explore both of those. Although in my opinion, a startup is the best path to getting innovative robot products out in the world.